Alexander Augustovich Klaus was one of the most notable and accomplished Volga Germans. He was born in Norka on December 13, 1829, the son of August Klaus, the church organist and sexton (a member of the congregation who maintained the church properties). Klaus was Chief of the Division of Colonial Affairs in the Ministry of State Property and prior to that served as Chief of the Saratov Kontora of Foreign Settlers. Klaus sharply criticized the activity of the Volga clergy which created a storm of discontent with the local pastors and complaints about him in St. Petersburg. As a result, Klaus was fired from the ministry. Klaus was the author of the the book Nashi Kolonii (Our Colonies) which was originally published in the Russian language in 1869. As the centennial year of the Mennonite sojourn in Russia approached in 1889, Mennonites began to develop an appreciation of their history. 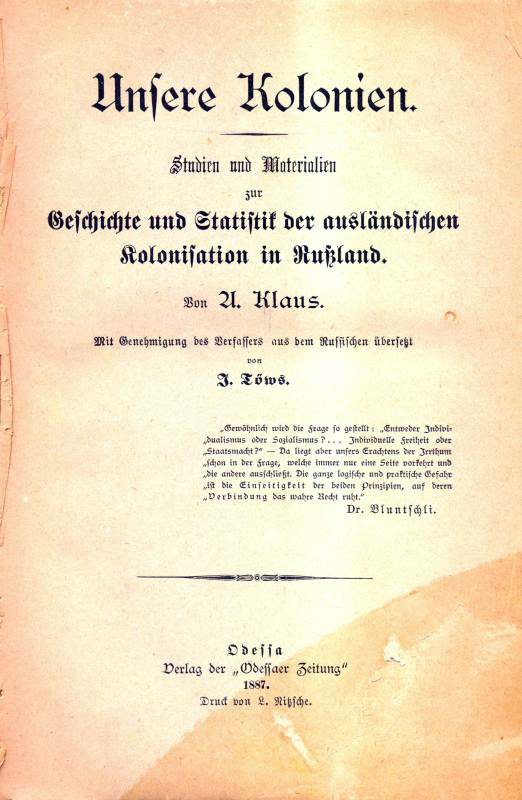 This prompted the wealthy miller Jacob Toews to translate Klaus’ book into German as Unsere Kolonien: Studien und Materialien zur Geschichte und Statistik der ausländischen Kolonisation in Russland. The translation omitted some chapters and appendices that were outdated by 1887. The book was published by Verlag der Odessaer Zeitung in Odessa, Russia. Klaus published several articles in the magazine Herald of Europe. Alexander Augustovich Klaus died on January 7, 1887. Sinner, Peter, Der Deutsche im Wolgalande. Saratov: 1926. This source states that Klaus was born in Norka. Schmidt, D. Studien über die Geschichte der Wolgadeutschen. Erster Teil. Seit der Einwanderung bis zum Imperialistischen Weltkriege. Zentral-Völker-Verlag, Pokrowsk: 1930, S. 295, Fußnote 2. Last updated April 15, 2017.